Prior to the league final there was little doubt that the Div 1 final was pitting the two form teams in the country against each other. They are the most recent all Ireland finalists, #’s 1 & 2 in the Division and both had impressive 10-point win’s in their respective semi-finals. Kerry were on a 6 game unbeaten run, which is impressive, but far inferior when compared to Dublin’s league and Championship run at the time of 21 games unbeaten (now 24). After a slow start Kerry have really hit their strides in the league. They boasted the 2nd best defensive record in Division 1 and were just a point off Roscommon in being top scorers at the other end. People will never tire of taking pics of the ‘traditional’ teams with 14 & 15 men behind the ball, but the best teams are adaptable. Both Dublin and Kerry played without a full-time sweeper in the first half of their semi-final’s, but when playing against a strong breeze and with a lead to protect Aidan O’Mahony and Cian O’Sullivan stayed at home. I think the best teams have the ability to adapt to what’s in front of them rather than go in with a complete script of how they are going to play. Kerry’s use of Kieran Donaghy will be interesting to watch as the season progresses. Although playing much more of a role in midfield throughout the league, especially for kickouts, he is not afraid to drift into the full-forward line when appropriate. 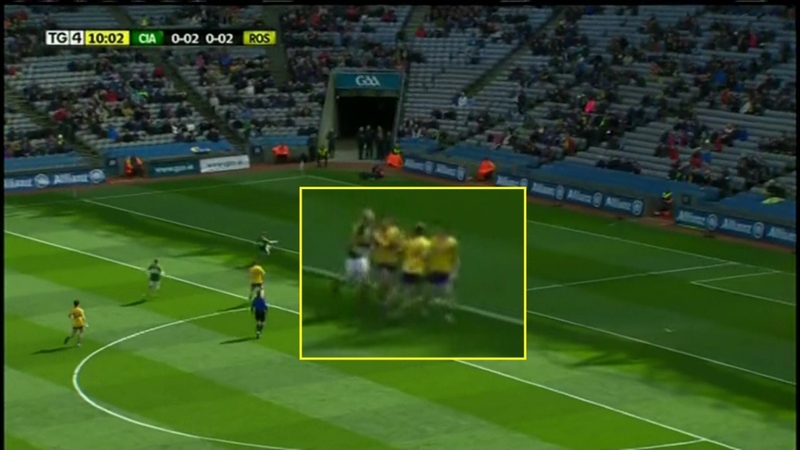 In this example we can see Kerry have just won the ball from a Roscommon Kickout. As the play develops Donaghy makes his way in to the full forward line. 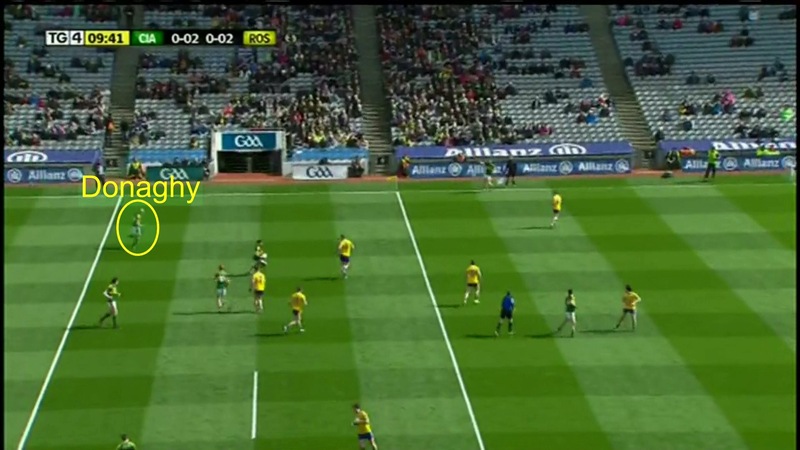 Perhaps spotting a mis-match or that Roscommon are slow in getting a sweeper in place. He finds himself behind the Roscommon defenders and there is now a 3 v 3 situation inside. It’s a fantastic pass to pick him out. Not only does he field the high ball but as he lays it off you will see how well he screens the players and makes the scoring opportunity even easier. 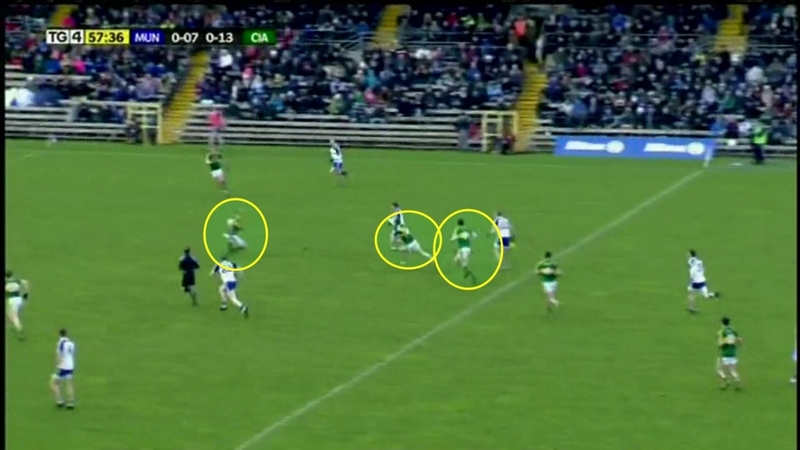 By simply holding his ground after laying off the pass he manages to occupy 3 Roscommon defenders. Kieran Donaghy will no doubt have license to get himself into these situations when the opportunity arises, regardless of where he is named on the team sheet. When we look at the stats over the league season Kerry don’t kick pass it the most (that prize goes to Dublin) and they are also not the most accurate (Donegal) but I think Kerry will be happy with those numbers. There is a danger in aiming for perfect, in that you never try anything that might open a defence. Paralysis by Analysis is often quoted, and sometimes that can be right. Teams need to be less obsessed with possession counts and passing % and look at how often players made the best decision with what was in front of them. Sometimes the risk is worth the possible turnover. 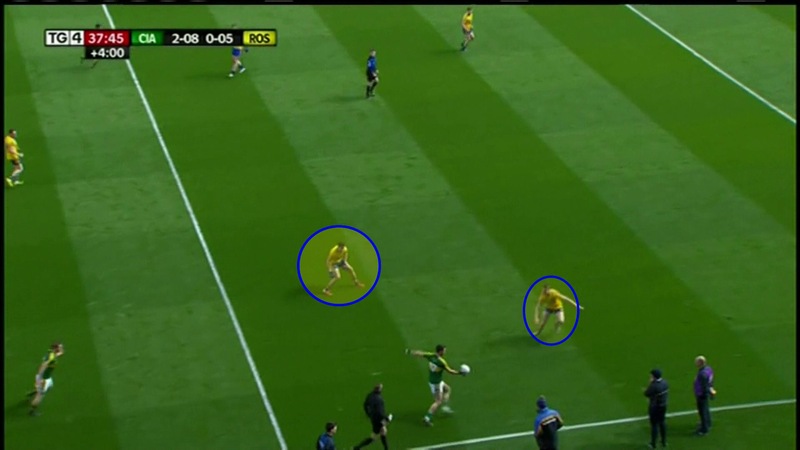 Kerry seem to have a good balance, where players like David Moran or Bryan Sheehan are not hauled off for giving away possession once or twice. They are free to play balls in and the Kerry management seem happy with the risk. 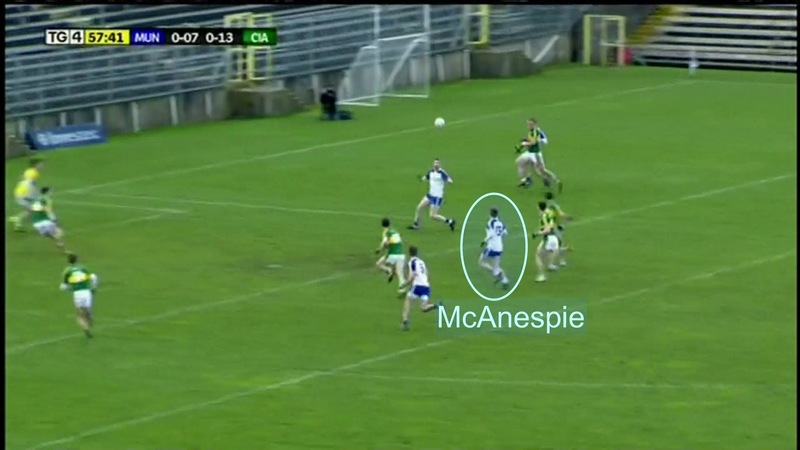 Take this example from the semi-final v’s Roscommon. Injury time is almost up at the end of the 1st half. Bryan Sheehan, not content to play out the half, takes a quick sideline ball and gets the ball back. With pressure on and time running out you would forgive Sheehan for turning back and keeping possession with a simple hand pass. However clearly unburdened by possession % stats he tries an ambitious kick pass. This is not Donaghy or Tommy Walsh he is trying to hit here but rather Darran O’Sullivan, who has no support at all. There is a large slice of luck involved and the defender gets his timing all wrong, but the point remains, how many teams and players look at that situation inside and are paralysed by losing possession and simply turn back and play an easy hand-pass. Instead the ball breaks and O’Sullivan slots in Kerry’s 3rd goal and puts any chance of a 2nd half comeback beyond doubt. One weakness Kerry do show is when they are attacked straight down the middle. The 2 goals they conceded against Dublin and the 1 against Monaghan are prime examples. 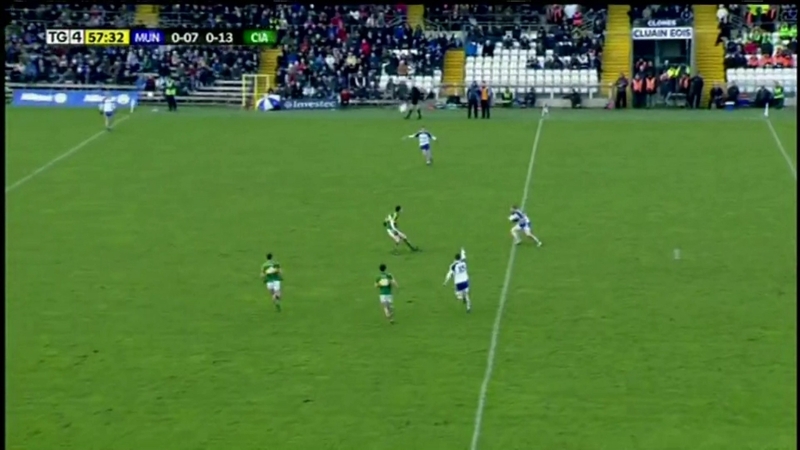 From a short kickout that actually lands inside Monaghan’s 21, they eventually get to half-way. 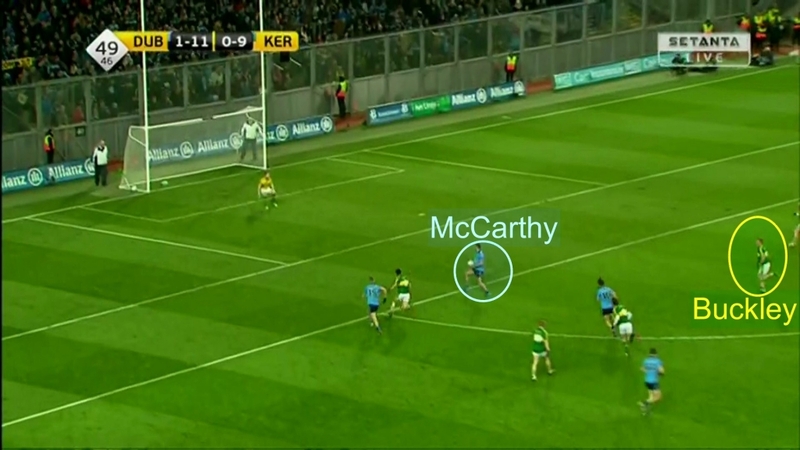 This is by no means a fast attack and Kerry should have plenty of time to set-up defensively. 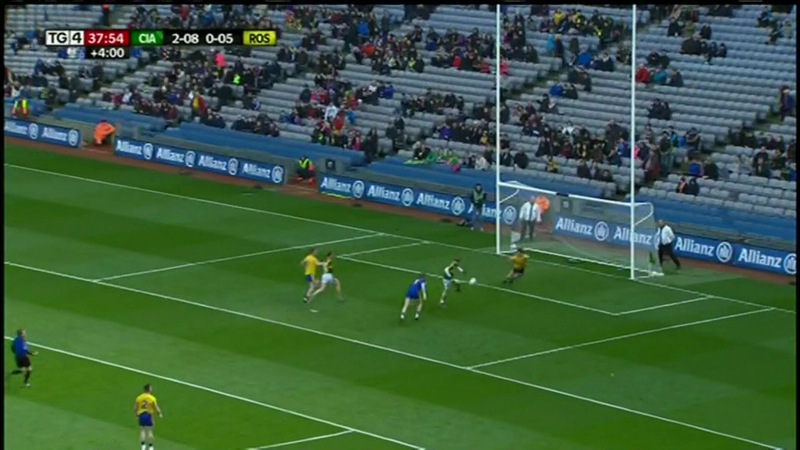 Kieran Hughes just puts the head down and runs straight at the Kerry midfield and defence. Kerry seem like they have the numbers in place but Ryan McAnespie just ghost through as if they are not there. He breaks through 3 tackles on his way to set-up what is a very soft goal to concede. 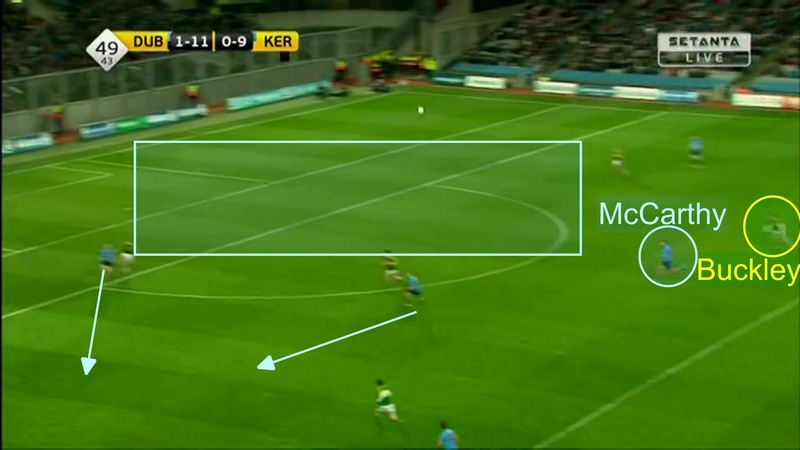 The two Dublin goals (regular season) will also worry Kerry, we will just take a look a the second goal they conceded that night. Aidan O’Mahony didn’t play and his presence at the heart of the defence was missed. James McCarthy picks the ball up in midfield. 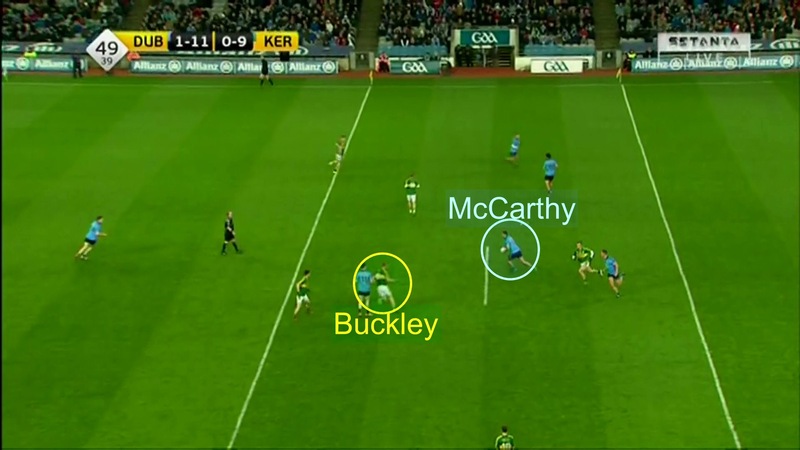 Keep an eye as we step through this firstly how costly a momentary lapse in concentration is for Johnny Buckley but also how little cover is inside for Kerry. Dublin have a great attacking shape here. 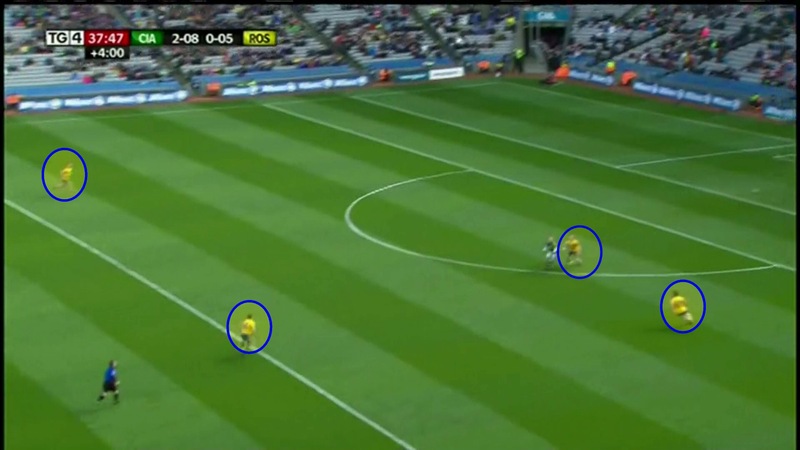 2 Men wide and 1 on the D. It’s a great kick pass that forces the last Kerry defender to come out from in front of the goal. 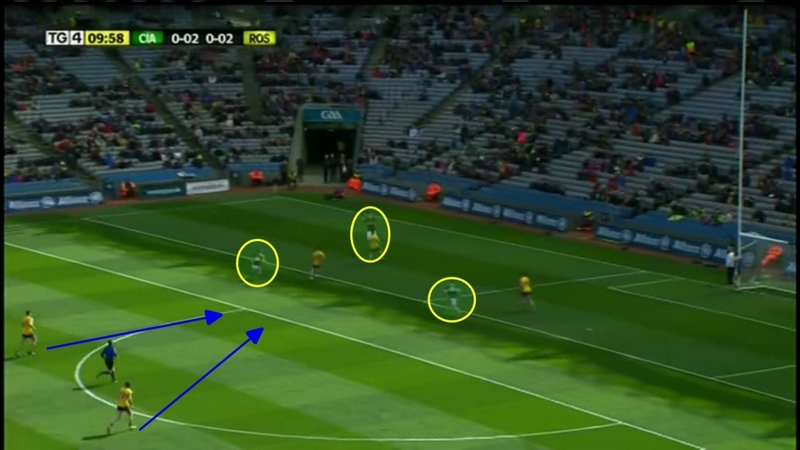 As the Dublin player on the far wings holds his position it leaves an enormous gap down the middle. Buckley is 5 yards off and because there is no cover there is real danger. As the pass is played to McCarthy you can see how open Kerry are. Without some sort of sweeper (permanent or roving) this is the danger of man v man defence. A well timed kick pass coupled with a well organised attacking unit will exploit these gaps. As I mentioned at the top of the piece Aidan O’Mahony spent the entire second half of the semi-final camped at sweeper never venturing very far. Maybe they won’t need that type of cover against Tipp on Sunday, but come Agust someone will be filling that role for Kerry.